You’ve been conducting interviews for a number of weeks or maybe even months and you’ve met a lot of great candidates, and finally you think you have found the one. In your mind, the search is over – it’s time to roll out an offer. So, cancel all the remaining interviews you have scheduled because this is a wrap, right? Here's why you should never cancel interviews you have scheduled even after you have extended an offer. You might be sold on the candidate, but that doesn’t mean that they’re sold on you. There’s always the chance they will kick an offer when it’s presented to them. They may try to renegotiate the salary to a point that it is out of budget. Or there’s the potential of a counteroffer from their current employer. Worst case scenario, they might actually be using your offer to shop themselves around to your competitors. Nothing is guaranteed until that candidate is in their seat on day 1. And even then, it’s still not guaranteed. If the candidate doesn’t work out over the next 1 to 12 weeks, then you have to reach back out to that pipeline and begin the search again. Do you really want to go back to someone you blew off last minute a few weeks ago? Look, it’s not easy to get a highly sought-after talent engaged and willing to come in for an interview, so why leave it at the door if there is potential there? You might be doing yourself a disservice by not seeing it all the way through. Obviously, once the candidate accepts the offer, that’s it, it would be a waste of your time and the candidate’s time to keep interviewing. But if you are still waiting on that offer to be accepted, the longer the candidate waits, the longer they are allowing for the opportunity to slip away. If in that time, you do indeed interview someone that would be a better fit, the candidate can only blame themselves that they allowed for that to happen. Employment brand means everything in the long run. And one of the biggest ways to maintain a high level employer brand is to make sure that every candidate that is in process has a good candidate experience. 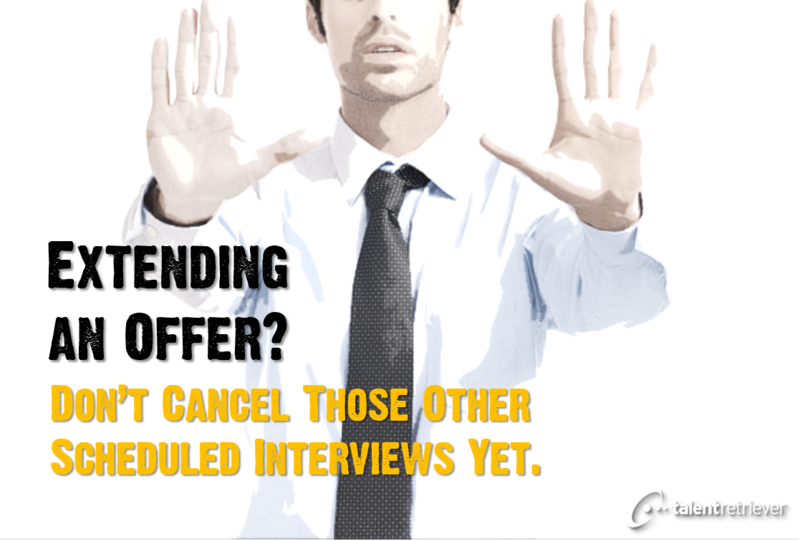 Canceling interviews with under 24 hours notice does not qualify as good candidate experience. Not to mention, candidates possess a lot of power when it comes to sharing this experience on Glassdoor. The site doesn’t just feature current or past employees speaking about working at the company, it’s also features candidates sharing their interview experience first-hand. Of course, there’s many other reasons you don’t want the candidate thinking negatively about your company including potentially reengaging with them down the line for other opportunities, and also never underestimate the fact that they could one day be a customer or a potential decision maker when it comes to using your service or product.